Tree felling isn’t a job for an amateur. In addition to knowing the local statutes that apply to tree felling—and there are plenty in most communities—only trained arborists have the knowledge to do the job safely without causing damage to your property. Tree removal costs in Sydney vary by arborist but they also vary by the type of job. Here is some information to help you compare the costs you’ll pay for your tree removal. How much of your tree do you need to remove? Removing an entire tree, grinding and removing its stump will, of course, cost much more than simply lopping, pruning, or even just felling it. Removing a tree completely requires special techniques—and costly equipment—to ensure safety for both the workers and your property. Large trees, too, require more work—and more man-hours. First, the workers must climb up into the tree to cut down limbs one by one, targeting each fall to avoid property damage. Next, the tree fellers use heavy equipment to fell the trunk itself. Most homeowners also want to get rid of the stump. Stumps not only detract from the looks of your property. They are a powerful attractant for wood-eating insects, which you don’t want anywhere near your home. To remove the stump, arborists use special equipment to chop up the stump and fill the hole in the ground where it once stood. 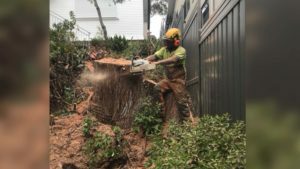 Depending on where you live in Sydney, tree removal costs may also differ by area due to regulations or how close your home or office is to other buildings. Don’t forget about the cost of paying your council for permission to remove your tree, To maintain the health of the environment, most councils have strict regulations about which kinds and how many trees you may remove. Most of them charge a fee for the permission. Many of them require that you plant one or more trees to replace the felled one to replenish the supply. How large is your tree? What is the location of your tree? How difficult is it to access our tree? What precautions will the fellers need to take? Will you need the workers to remove the stump? Will the tree removal company need to transport your tree to recycle it? How much will the permit fees be? Use these guidelines to get a rough estimate of what you may have to pay. Note: These are only a rough estimate of the average costs associated with tree removals in the Sydney area. Removal costs vary by type of tree, condition, and location. Depending on the challenge involved, these situations can ramp up the cost of a tree removal to as much as $10,000.00. After you’ve considered your budget, as well as what you may have to pay, you need to compare estimates. Get at least three on-site inspections, since estimates can vary widely. Limit your search to arborists who carry public liability insurance, have the proper qualifications (a Certificate II in Arboriculture or Horticulture, or a Certificate III for supervisors), and are members of Arboriculture Australia or other professional associations. These qualifications ensure that your tree felling company is up to date with the latest technology and techniques in the industry. One thing is for sure—if you have a tree that may harm your home or commercial building’s foundation, a diseased one that can infect other trees in the area, or a dead one that provides a welcome mat for termites and other insects—tree removal costs will be way less than if you let the problem remain. For more information about tree removal costs or to schedule an estimate, contact the tree removal experts at Wolf Trees and Gardens today.